Green HIlls, Morning Mist. © Copyright 2019 G Dan Mitchell – all rights reserved. 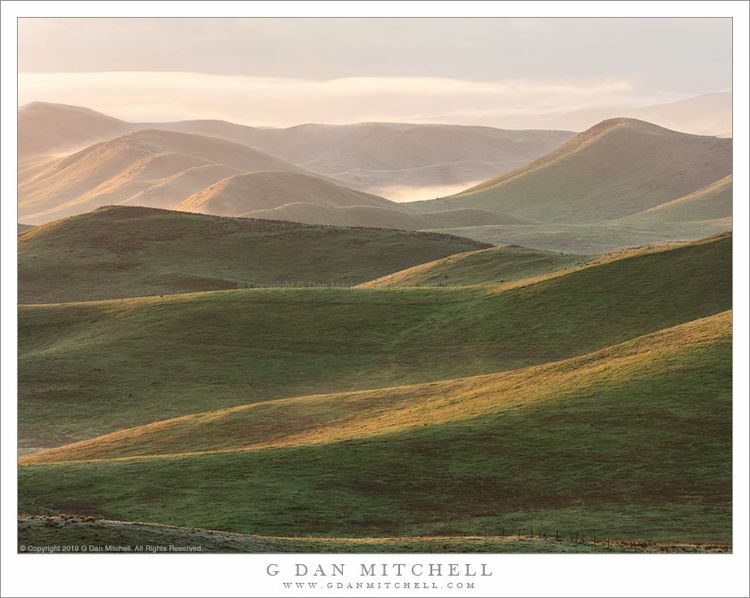 Morning fog and mist above green California spring hills. Many people who visit California for the first time are surprised by how dry much of the state is for most of the year. In many places — most of Southern California, the deserts, the Central Valley, coastal hills, even along portions of the coast — the predominant colors from late spring through autumn are golden and brown. What they don’t know, but may learn over repeated visits, is that much of the state passes through a miraculously green interval every year during late winter and early spring. During this time that dry, brown terrain becomes “impossibly green” for a short period. This week I visited one of those places that seems desert-like during most of the year. Following recent rains there was mud everywhere, and even the driest of hills was sprouting new green growth. I camped up in a valley above a large plain, and when I arose in pre-dawn light I swore that this arid valley appeared to be full of fog. I broke camp in near-darkness, and as I drove down I entered the fog bank, which soon began to drift and thin in early sunlight, revealing this landscape of overlapping slopes, edges marked by the low-angle light.